How do children develop poor posture? Have you ever observed a baby sitting on the floor. They have perfect posture. Nobody is telling them to “sit up straight!” They just do this automatically. If you observe their movements you will notice something quite beautiful. They sit upright effortlessly with their pelvis positioned well to perfectly stack the spinal discs and vertebrae up above it. Their shoulders are well back and their necks are long and straight. When they bend to reach for a toy or some other object, they hinge forward from their hips and reach using their entire body moving from the hips toward the object. Their shoulders remaining well back while performing this task. 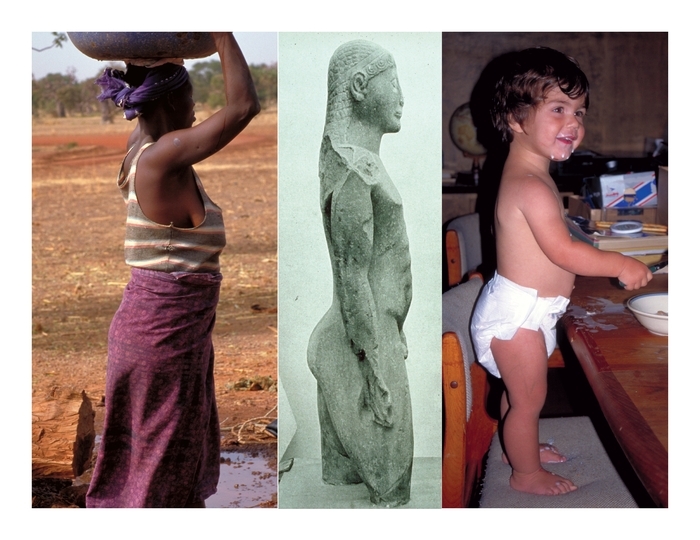 If you look at a toddler standing, you will notice the same type of posture. It’s perfect! They have very straight spines and they don’t have much of a curve at all until you get to the very bottom of the vertebral stack. Then there is a significant curve at L5- S1 on the spinal chart. You will again notice that this posture is natural and not at all strained. They carry their weight over their heels and weight bearing bones. The body is remarkably well aligned. If you think about it, babies are experts at finding the right balance and plumb line to keep their rather heavy heads aligned over their spines, the equivalent of a bowling ball, perfectly aligned on a stick. If you look at our ancestors, ancient civilizations or non-westernised cultures you will notice that this posture stays in tact into adulthood. The key is the alignment of the pelvis. 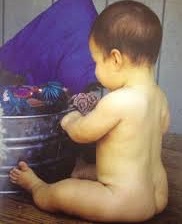 Babies are role models for natural healthy posture. So when do they lose this and become the slouch potatoes that we see so often in school aged children? How does a child born with perfect posture become bent over when sitting at a desk or watching TV? 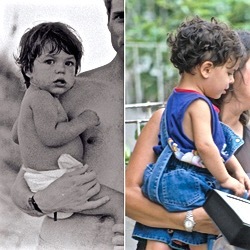 It pays to look at how we handle them as babies. How do we carrying them? What types of baby furniture are we placing them into? If you look at the photo of the two babies, you will notice the difference between the one sitting naturally up right with her pelvis out behind her (Right) versus the baby on the left who’s pelvis is being tucked. The one on the right is being perfectly supported by her mother’s forearm providing a platform for the child to sit on. You will notice that her upper back is straight and her pelvis is anteverted and her behind is behind her. This way of holding a child lets them align naturally. It also saves the parent from developing RSI or carpal tunnel syndrome because they are using the larger group of muscles found in the forearm to support their baby. The baby on the left is being forced to round her back because the parent is using his hand to tuck her pelvis underneath her. She has no choice but to round her back to stay upright. Dad is also putting himself at risk of RSI and tendinitis if this is his default carrying position. Newborn baby girl slouched over and sound asleep in her car seat. round their back. This can cause all sorts of issues now and later in life, slouching, digestive problems, breathing problems and more. It is best that we add some support to the furniture to get them more into an “L” shape rather than a banana shape. 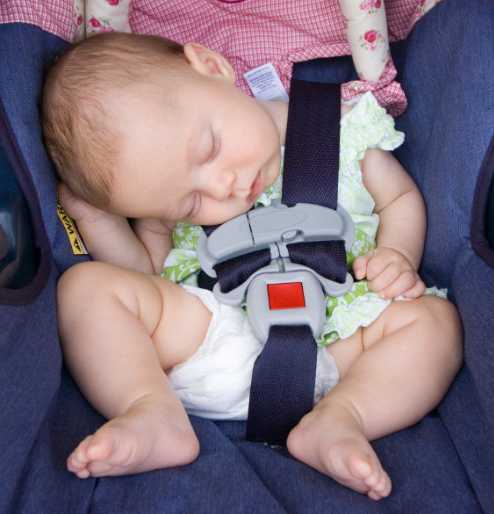 It is never wise to leave a baby sleep in a stroller or car seat. Always get them out of there ASAP and put them in a crib or on a blanket on the floor to sleep. Leaving a child in an unhealthy position can cause all sorts of postural issues not to mention it could compromise their airway. There are many causes as to why our kids are sitting poorly. But baby furniture and the way we carry them are very real culprits. We need to be more vigilant in re-educating ourselves, parents, teachers and other influencers of our children on proper posture and alignment. The correlation between posture and back pain has been a real blind spot in today’s society. We need to become role models for our kids. The old “sit up straight or put you shoulders back” isn’t going to cut it. These commands are not sustainable and can cause more harm than good. This entry was posted in Gokhale Method, Health & Well Being, Massage and tagged Alignment, Back Pain, Children's posture, Gokhale Method, Healthy Posture, Low Back Pain, Neck pain, OHS, Poor Posture, Posture. Bookmark the permalink.